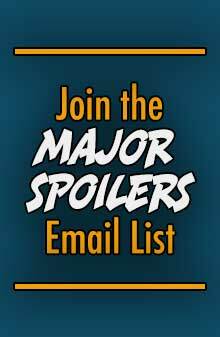 The “Forever Evil” event continues to shake things up in the DCU. Admittedly a small one in terms of number of releases, this week the fourth issue of this miniseries hit the stands! It’s all-out chaos as the DC Universe continues its march through darkness! War erupts across the Earth between the villains! Allegiances are formed! Rivals are murdered! And at center stage it’s Lex Luthor versus Batman – and their fight couldn’t come at a worse time as Deathstroke’s hunting party closes in on the world’s only hope against the Crime Syndicate! Lots of action as well as strong character development make things extremely interesting. Secrets are revealed, and fascinating alliances are formed. You’ll need to know what’s happening in Forever Evil to pick up what’s happening here! Usually, I really don’t care for events such as this one. But I’m such a big fan of Mr. Johns’ writing that I gave this (as well as his previous events) a chance, and I’m really enjoying it. What Forever Evil reminds me a lot of is 24, the Fox series that starred Keifer Sutherland. There were multiple storylines going on, and when one of them required some quiet time, another would rise up to take its place. I like that, honestly! First up is Batman and Catwoman, as Selina Kyle gets her first glimpse of the Batcave. The Dark Knight also shows an arsenal of weapons he’s gathered over time to her, not realizing that Grid is watching! There’s a very significant development in the Superwoman/Ultraman relationship this time, as the Kryptonite-eating villain learns one of her secrets. Power Ring continues to be an exact opposite of Green Lantern, wracked with fear. Heck, even his ring talks down to him! Luthor and his band of super-powered folks bust into Wayne Enterprises, finding Batman and Catwoman already there. Then Power Ring and his group break in. When the Dark Knight tries to battle Power Ring with one of his weapons, it quickly runs out of energy. But that’s not the last time we see that device in this issue! I was particularly touched by Luthor’s brief encouraging talk with Bizarro. I always like it when Lex doesn’t wear a totally black hat, but chooses grey every once in a while. David Finch remains one of my favorite artists because he can make action literally “pop” off the page. He also has a great way with character’s faces and their costumes. I still enjoy his Batman the most. Finch also does a nice job using single-page or double-page panels. My favorite was when Catwoman sees the Batcave and says, “Nice bachelor pad.” Next up was Power Ring literally screaming at Grid through the view screen. Scared, you bet! 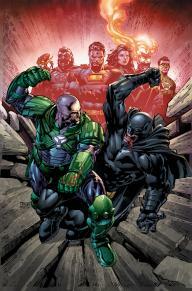 BOTTOM LINE: FOREVER EVIL CONTINUES TO BE A GREAT EVENT FOR DC! My biggest concern is that someone dropping into this issue would likely be pretty lost. It does require knowledge of what happened previously to “get” the plot this time. Still, I like that DC is planning big changes for their universe. 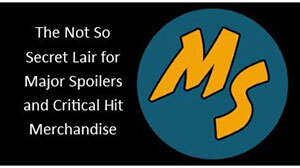 I have some guesses as to what they are, but I wouldn’t want to spoil anyone, even at MajorSpoilers.com! 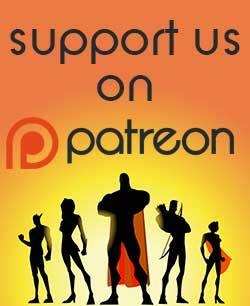 I also continue to be fascinated with what’s up with the Crime Syndicate. They don’t quite make sense yet. I just gotta know! Look for me to be keeping up with this even as it heads to its conclusion. This is what I wish more multi-issue events were like!